I made it to QuiltCon! I really should be sleeping, as I woke up at 3:00am PST to make it to the airport for my 6:00am flight, but I want to record a few things about the day before forget. 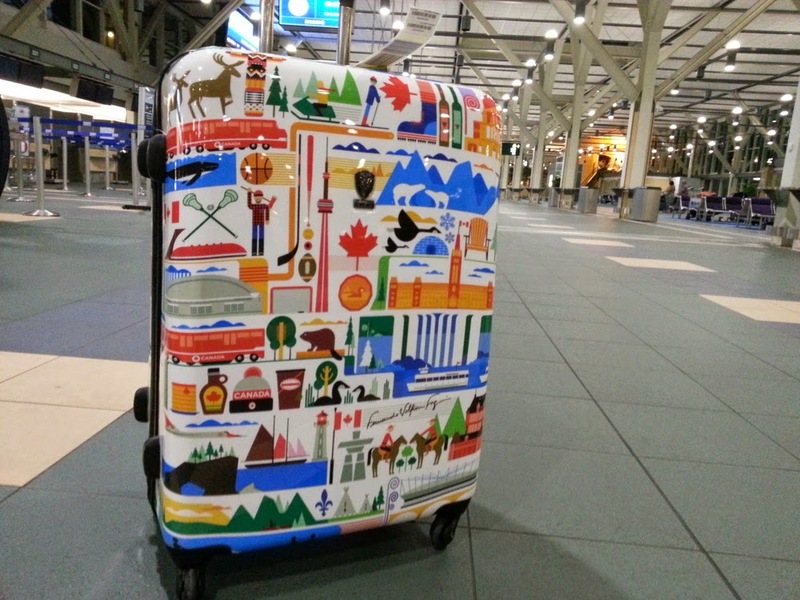 1) My new Fernando Volken luggage is awesome and received many compliments. After twenty years with the same suitcase, it was time to move on and I couldn't be happier! I was one of the first to get one of the coveted Fancy Fox buttons from Elizabeth Hartman! 2) The day was like a snowball of quilting friends that started when Jo-Anne (juicyredbee) joined me on my flight to San Francisco. Then, Magdalena, a former VMQG member, found us in the SFO airport and it turned out she was on our flight to Austin. Elizabeth Hartman was also on our flight and immediately shared her awesome buttons! 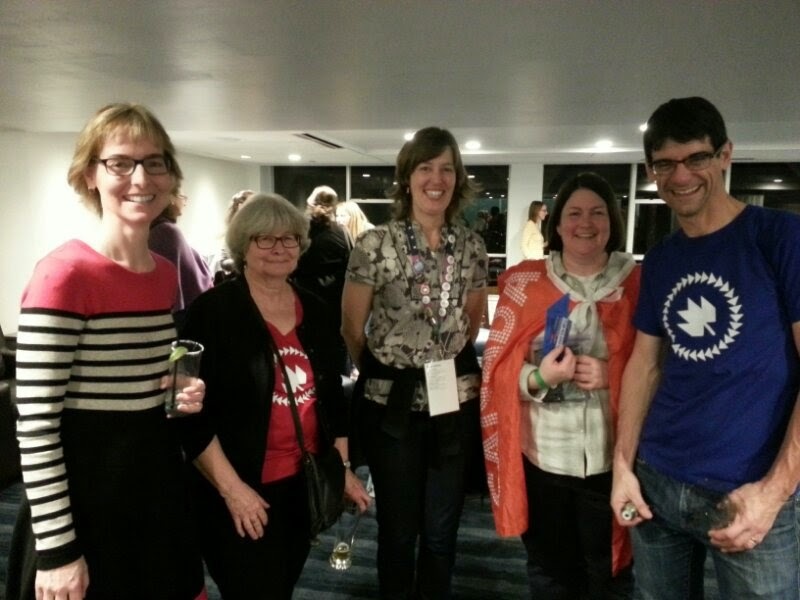 Check-in at the hotel, QuiltCon registration and the Canadian Meet Up were just more chances to see familiar faces and meet new friends! 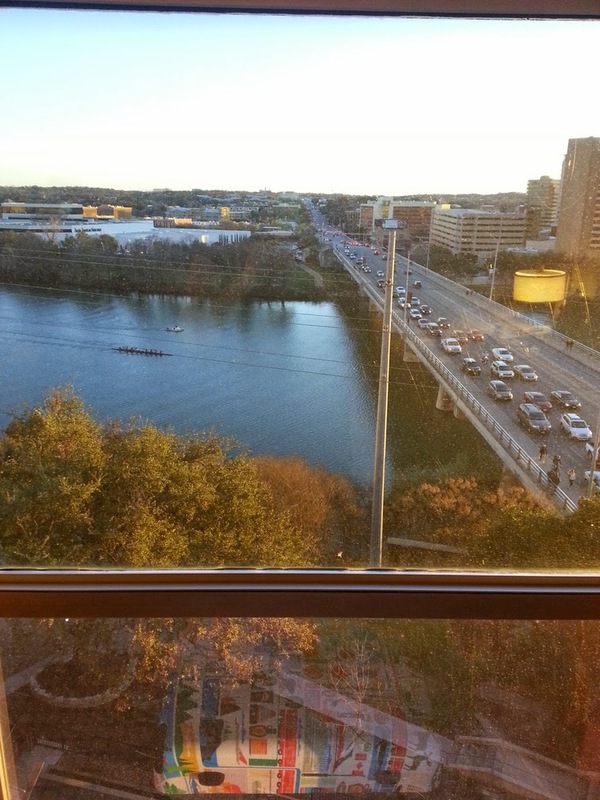 I loved the view from my room on the eighth floor! Hello rowers! 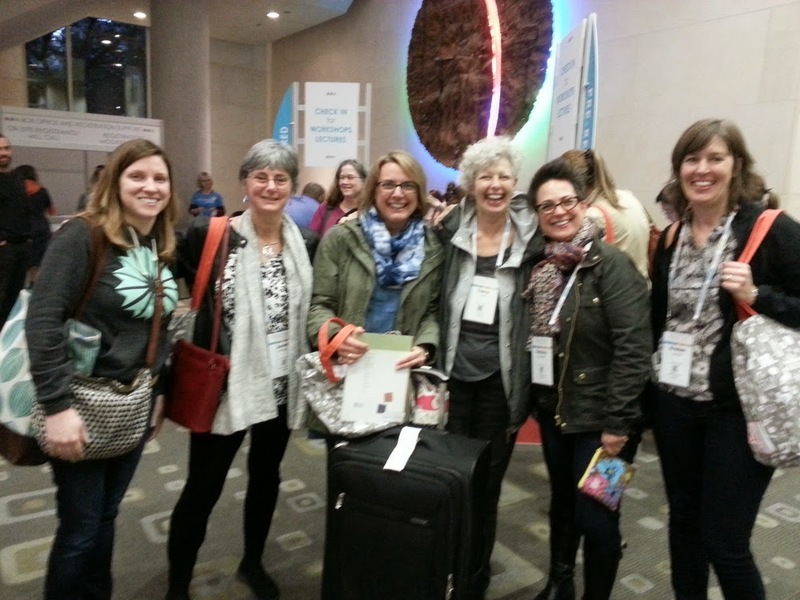 3) We arrived in Austin around 4:30pm CST and ran into Kristen, Terry & Janet at the baggage claim! At the hotel, my kind roomie Debra had brought Florida oranges. I also got to finally hug Lee, chair of the Leadership Conference Committee. Pin swapping has begun! 4) Registration was cool, they just took your name and automatically printed your name tag with your schedule conveniently located on the back! Haven't even had a chance to look at my goody bag yet, but I'm excited to read the copy of Uppercase magazine in there (yay for Canadian content!). So many familiar faces at registration! Uber-busy Elizabeth Dackson and Alissa Haight Carlton zipped past. 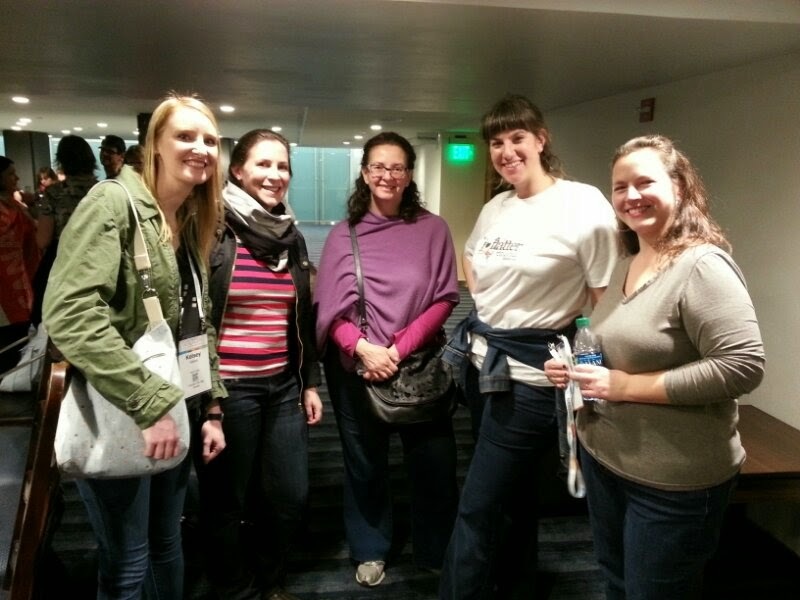 Met friends from Seattle and Portland who I've gotten to know through our PNW MQG meet ups. Ended up going to dinner with Jenn (pinkbrain_here) and Denise (walked out of Crave after 15 minutes with no service, but had a yummy Thai dinner). 5) The Canadian Meet Up! I organized this event along with Jaclyn, Joanne, and Alison. About 40-45 Canadians (and ex-pats, and a few Aussies, and one woman from Colorado who we let in because she had French on her sweater!) 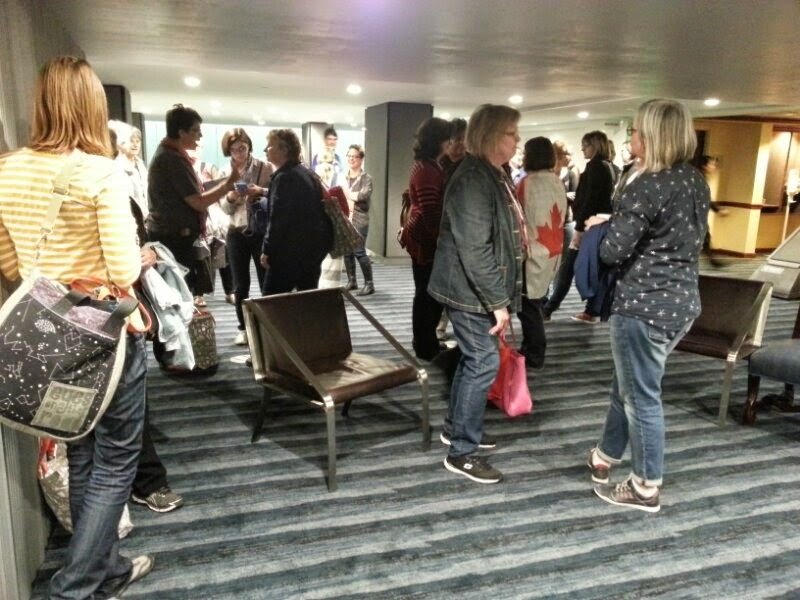 met up in the lounge at the Radisson. We had prizes kindly donated from several Canadian shops. Amy (amyscraftyshenanigans) was our mascot in a Canadian flag cape. Unfortunately, some folks had travel delays and weren't able to make it, but we look forward to seeing them soon! Lots of connections were made! 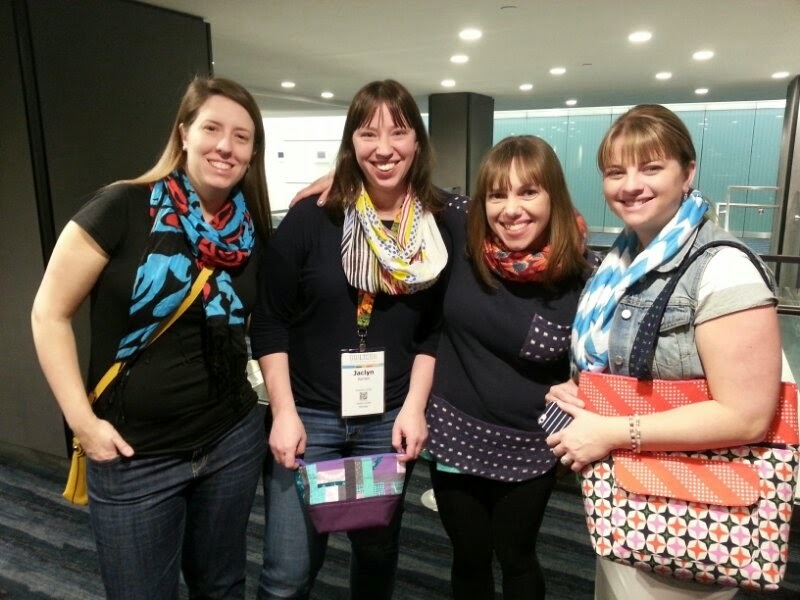 It's fun to meet people who you know online, especially friendly quilters! Ok, it's time to rest and get ready for the first official day of QuiltCon! 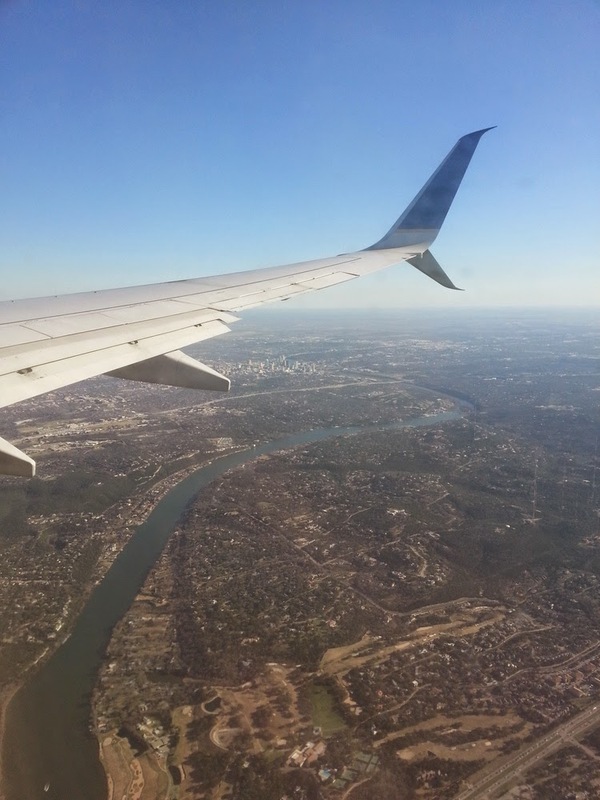 In less than two short weeks, I'll be in Austin for my second QuiltCon. I can't wait! 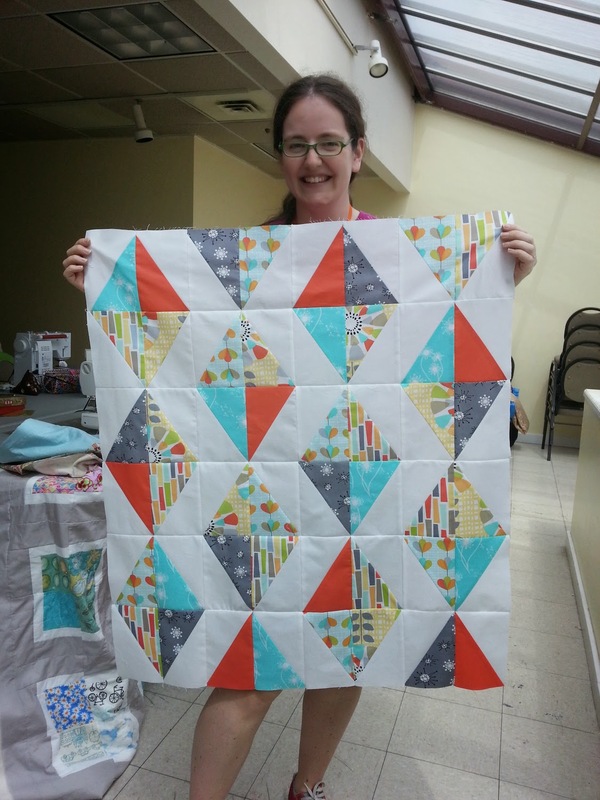 I joined in on the #helloquiltcon hashtag on Instagram, but thought I'd post an introduction here as well. The old blog is pretty quiet these days (I think I just saw a tumbleweed blow by! ), so if you want to find me, I'll be on Instagram as @hollybroadland. You can also learn about me on my About page. Hi! 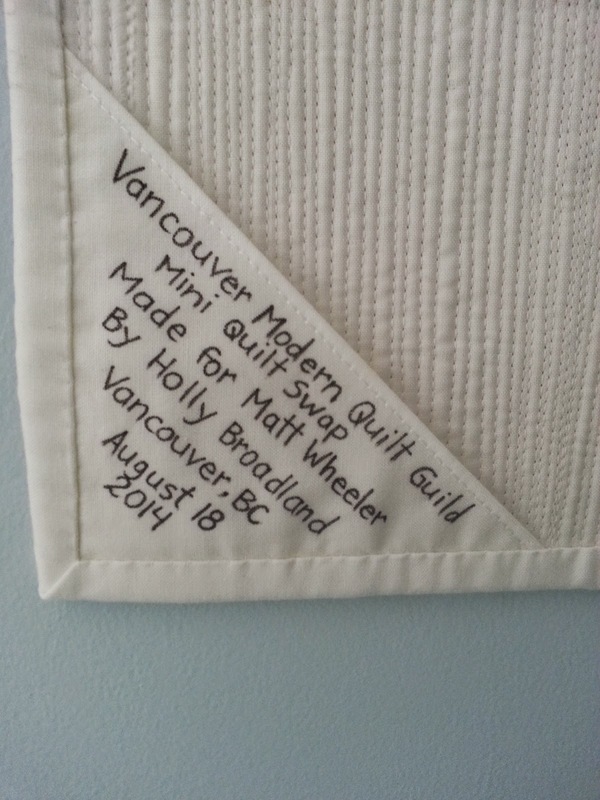 I'm Holly and I'm the founder and Co-President of the Vancouver Modern Quilt Guild. For the past five years, the VMQG has been the main focus of my life outside of family. 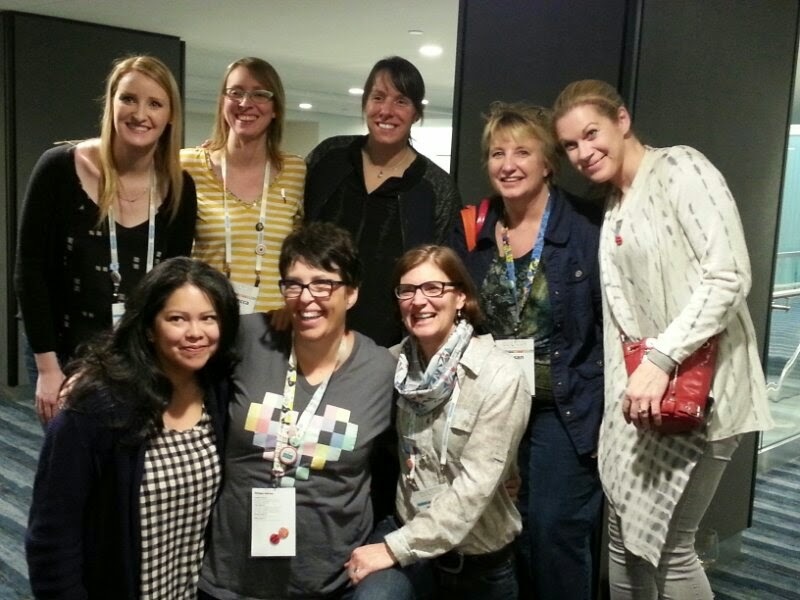 It has been a wonderful place to find new friends and get inspired to quilt. It's also been a way of defining myself outside of my treasured roles as wife and mother, and I appreciate that to no end! I'm also a keener who volunteers for The MQG on the Leadership Conference Commitee. 1) I was born in Campbell River on Vancouver Island in British Columbia, Canada. 2) I'm a chronic procrastinator (case in point, I haven't ordered my #quiltconpinswap buttons yet and I fly out on the 18th!). 3) I was a high school rower for three years and competed twice in the Canadian high school rowing championships in St. Catharines, Ontario. If I'm on your team, I will pull hard and not complain. 4) I'm a wannabe librarian and I love substitute teaching in school libraries. 5) I'm on the introverted side, but when I'm around my quilty peeps, my extroverted side comes out. 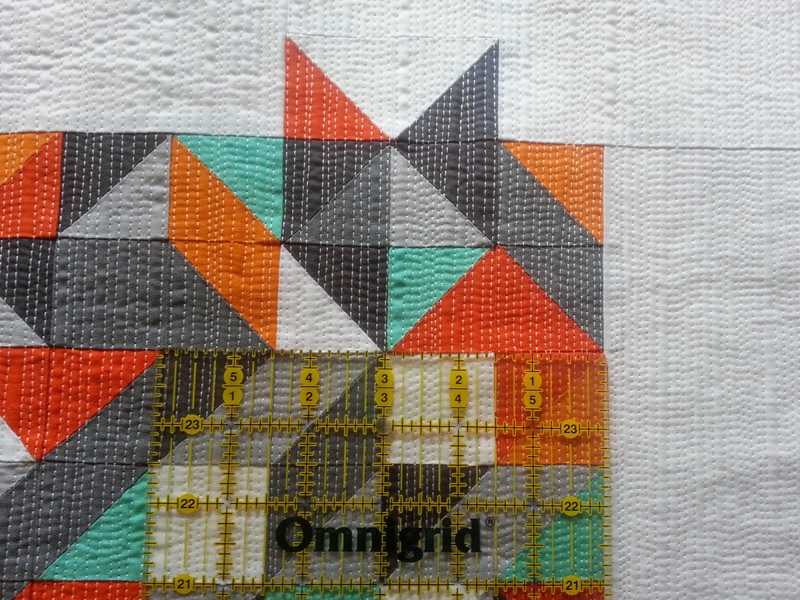 I can't wait to connect with lots of online friends while I'm at QuiltCon! 6) I love books. I can't imagine life without a book on the go at all times. I'm currently reading "Wings of Fire: The Dark Secret" by Tui T. Sutherland because my seven year old got me into this series about dragons. 7) I'm a lefty who prints neatly. 8) You know the saying, "Who doesn't love free stuff?"? Well, it's me. I don't love free stuff. I'm an environmentalist who lives in a small space and I already feel overwhelmed by the amount of stuff in our two-bedroom condo. Last night, I ordered pizza and they gave me a free plastic plate and I handed it right back to the delivery guy. 9) If I weren't an elementary school substitute teacher, I could see myself being a copy editor. I just can't help spotting spelling mistakes! 10) I don't wear makeup. I didn't even wear any for my wedding because it would have weirded out my husband. The closest thing I have that resembles makeup is Burt's Bees lip balm with a little pink tint to it. 11) I love my Converse All Stars! I had a green pair in high school and now I have a red pair. I kinda want a whole rainbow of them (I am Rainbow Girl, after all!). If you see me at QuiltCon, please come up and say hi! It's time to wrap up Q3 of the Finish-a-long and I've completed one project out of the list of seven that I posted on my blog in July. I'm not surprised I only finished one project, but I am happy to report that progress has also been made on my Madrona Road baby quilt and I hope to finish it before the VMQG's UFO Challenge wrap up on October 20th. I quilted this 40"x40" quilt in a spiral pattern at a summer VMQG sew-in. It was finished in 3.5 hours! This was my second time quilting a spiral and I have to say I love the look of them. I went overboard with floral prints on the back and used large pieces of Heather Bailey and Erin McMorris fabric. I sewed the binding on by hand at two quilting events: a few stitches at the PNW MQG meet up sew-out at Trout Lake Park (I got distracted by chatting and hardly accomplished anything!) and the rest at the Guild Gathering, a meeting of local guild leaders that is held twice a year. As this was my longest standing WIP, I'm very happy to have it completed. My goal is to cut down on my UFOs to allow myself room for new projects without feeling guilty about the projects I've abandoned. Wish me luck! In honour of the autumnal equinox today, and the fact that it coincides with the momentous return of British Columbian public school students to school, I thought I'd share a lovely series of books celebrating the four seasons. 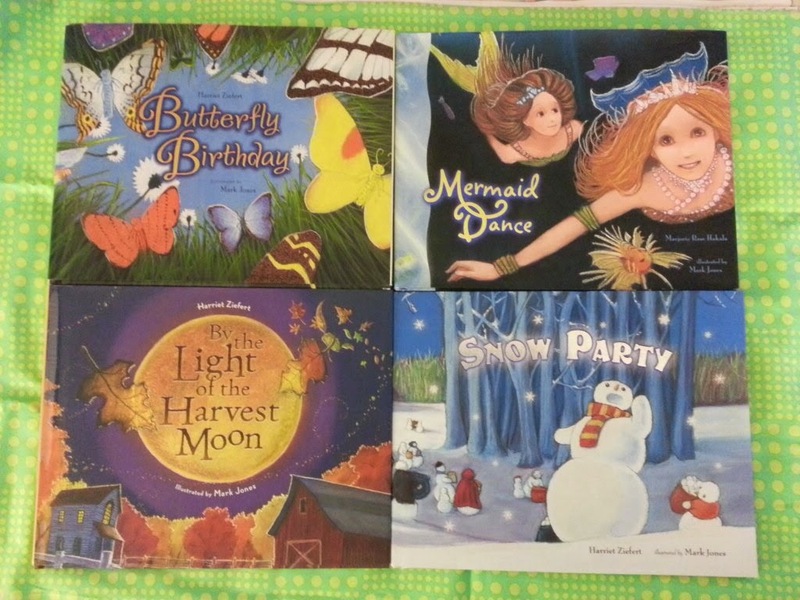 Three out of four of the books are written by Harriet Ziefert and illustrated by Mark Jones with "Mermaid Dance|" (summer) being the outlier (written by Marjorie Rose Hakala and illustrated by Mark Jones). I was first introduced to this series by a friend and became slightly obsessed with collecting the whole set. Caveat: some of these books are hard to find, I think "Mermaid Dance" is particularly rare. They were all published by Blue Apple Books between 2008-2010 and I think they're mostly out of print. 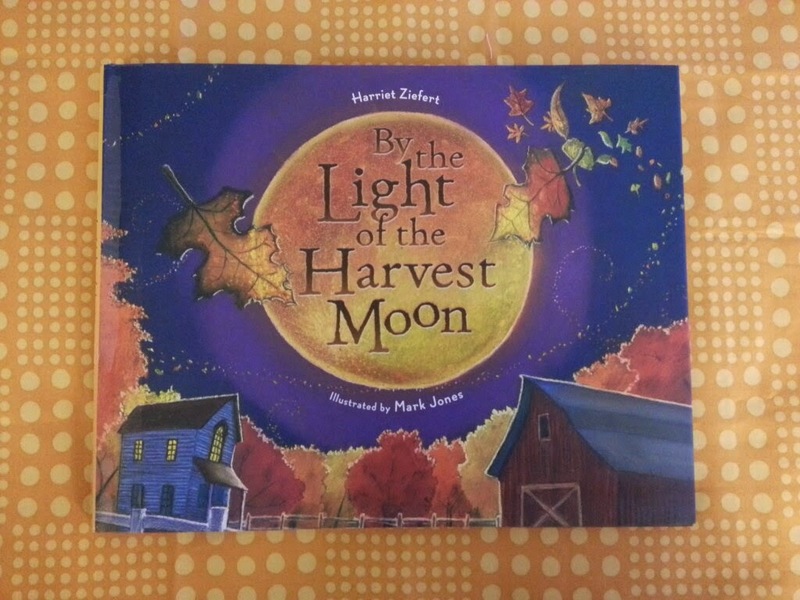 "By the Light of the Harvest Moon" celebrates the autumnal equinox. I've been reading it to my daughters over the past week and we brought it to school today so Sophia's teacher could read it to the class. What I love about these stories is that they're whimsical stories with imaginary characters and they centre on the equinoxes and solstices. If you're aware of other fictional series about the seasons, please let me know, because I love to celebrate the change of seasons! 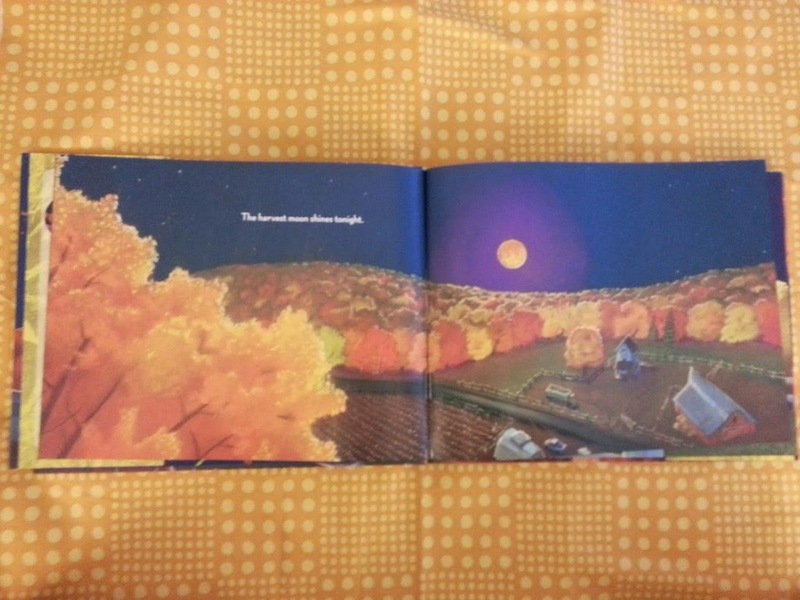 The book is full of beautiful illustrations and starts with a harvest moon rising over a hillside full of yellow, orange, and crimson trees. 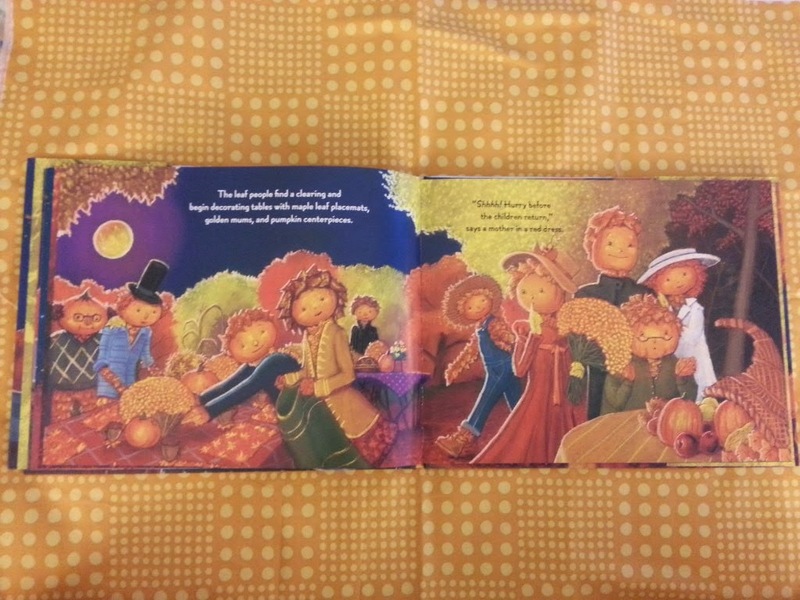 The leaf people enter the picture and start preparing for a big party to celebrate the autumnal equinox. It turns out it's a dessert party, the best kind of party! 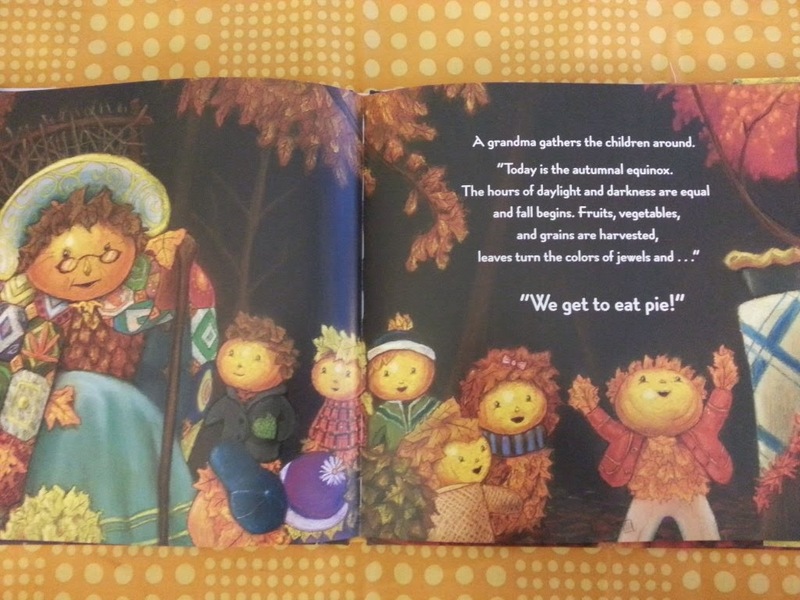 Then Grandma tells the children what the equinox means and everyone eats pie. All's well that ends well! 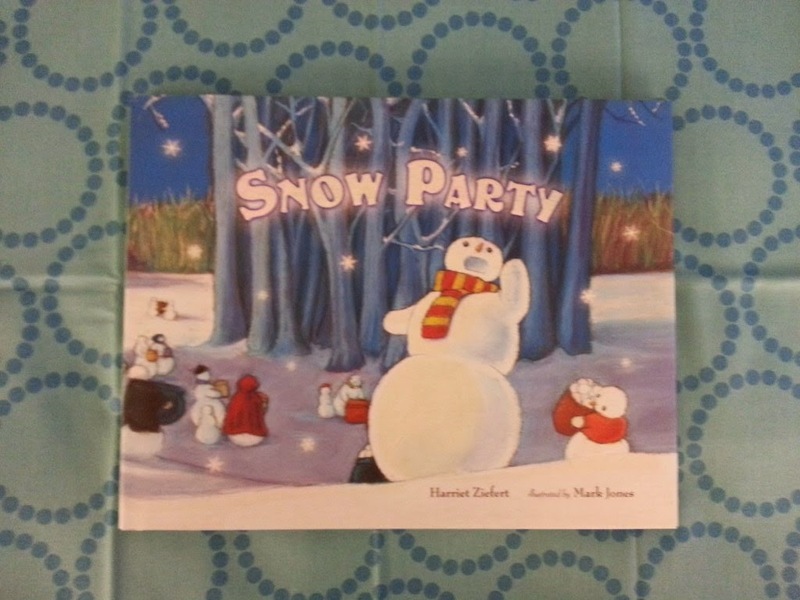 The series continues with "Snow Party" about a group of snowmen (snowpeople? they are men, women, and children) who have a winter solstice celebration complete with music, dancing, and icy treats. 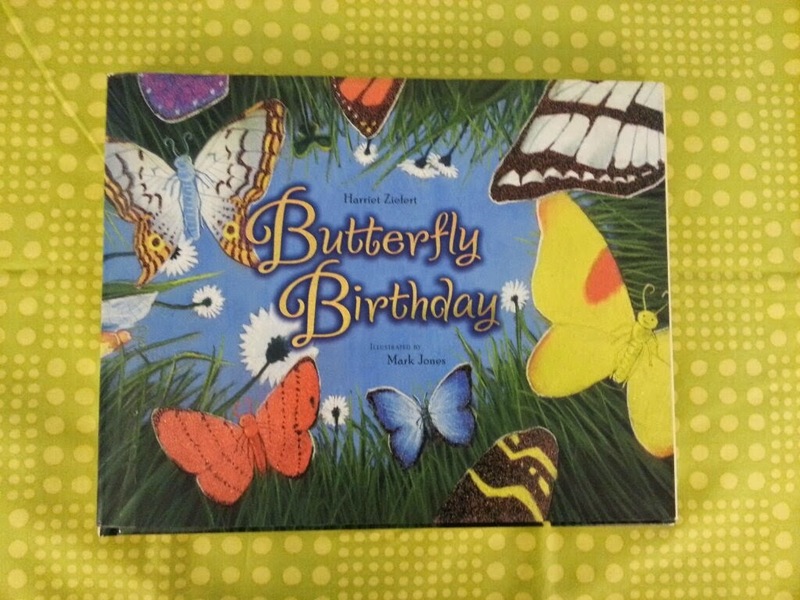 The first book I purchased from this series was "Butterfly Birthday" and I gave it to my daughters, who have birthdays very close to the spring equinox. In this book, all the insects gather for a party to celebrate the coming of spring and at the perfect moment, the butterflies emerge to take the celebrations to the next level. 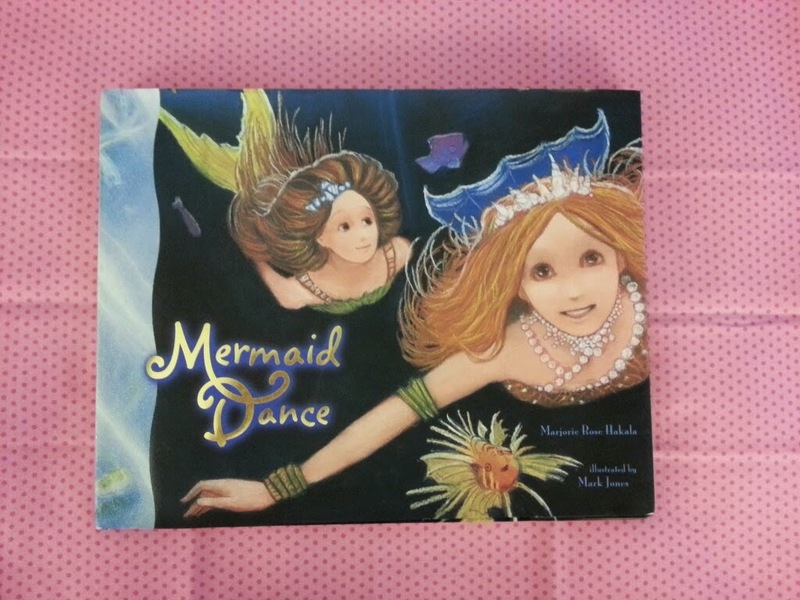 The last book in this set is "Mermaid Dance" and although it was written by a different author, it still has Mark Jones' lovely illustrations. In "Mermaid Dance", a group of mermaids has a summer solstice feast at the seashore. 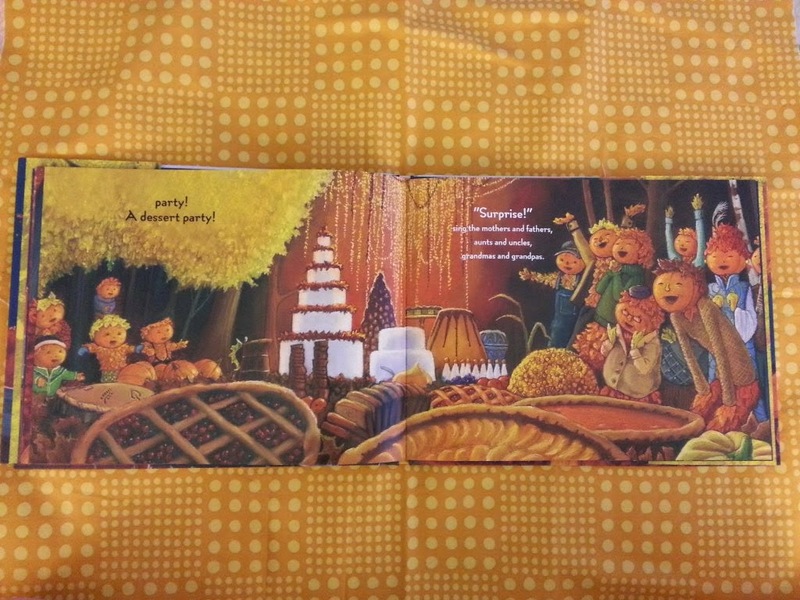 I hope you've enjoyed this peek at this collection of books celebrating the seasons. I wish you luck in finding them in your public libraries, used book stores, or favourite online sources. Happy autumn! 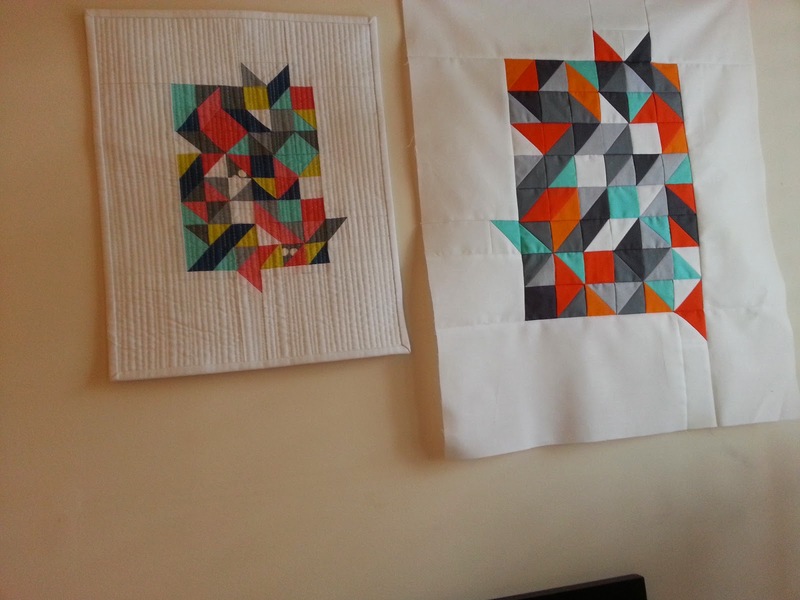 My original Memories of QuiltCon quilt had HSTs that finished at 1" and the squares in the one I made for Matt finished at 1.5". Just like with my original, I had fun doing some dense matchstick quilting. 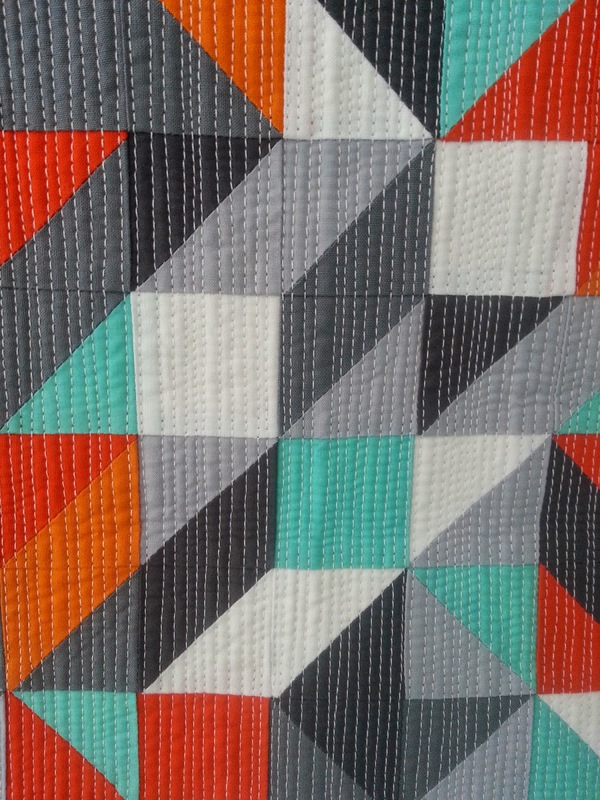 I love how the placement of some of the squares and HSTs led to a 3D effect in the centre of the quilt! I was pressed for time, as I was finishing this at the last minute, so I tucked my label into the corner and sewed it in with the binding. 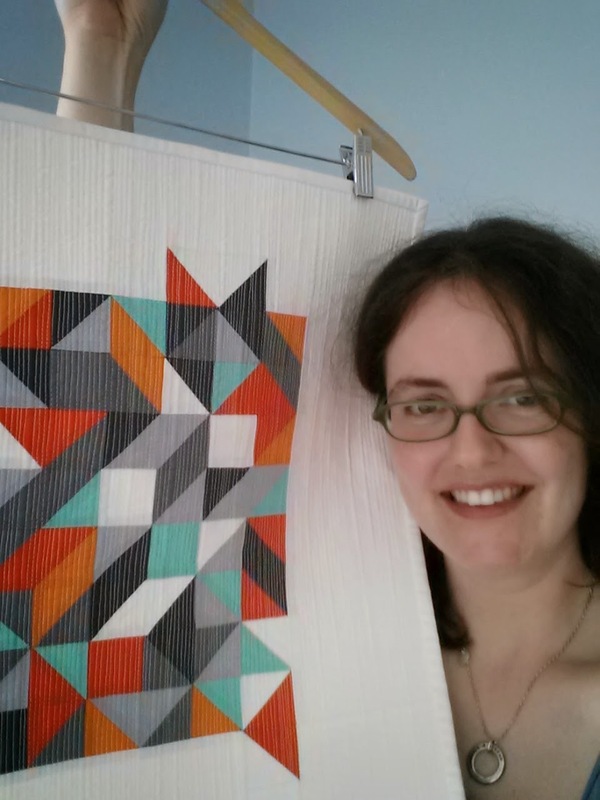 Here are a couple shots of me and my quilt in our very short-lived time together! 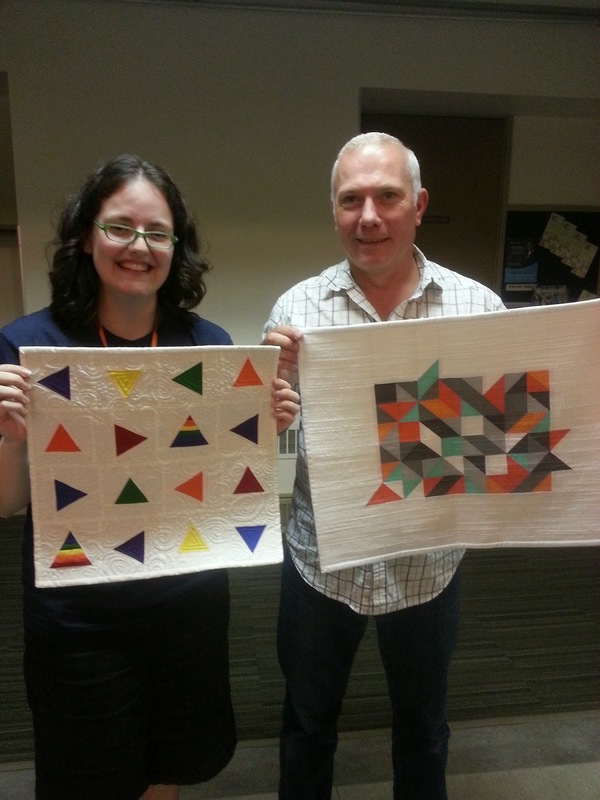 Me and Matt at the August Vancouver Modern Quilt Guild meeting after we'd exchanged quilts. Most people didn't swap with the person who was making a quilt for them, but I was lucky enough to be paired up with Matt. He made me this beautiful quilt full of all my favourites: triangles, brightly-coloured solid fabrics, rainbows, and geometric shapes! Although my participation in the Finish Along has been erratic, I think it's a wonderful idea and a great way to stay motivated to finish up those long-standing WIPs! I've amassed quite a few in the past several years, so I'm staying motivated by linking up to the Q3 Finish Along with The Littlest Thistle. Do you want to participate and have a chance at winning some great prizes? Sign ups for Q3 are open until July 14th. 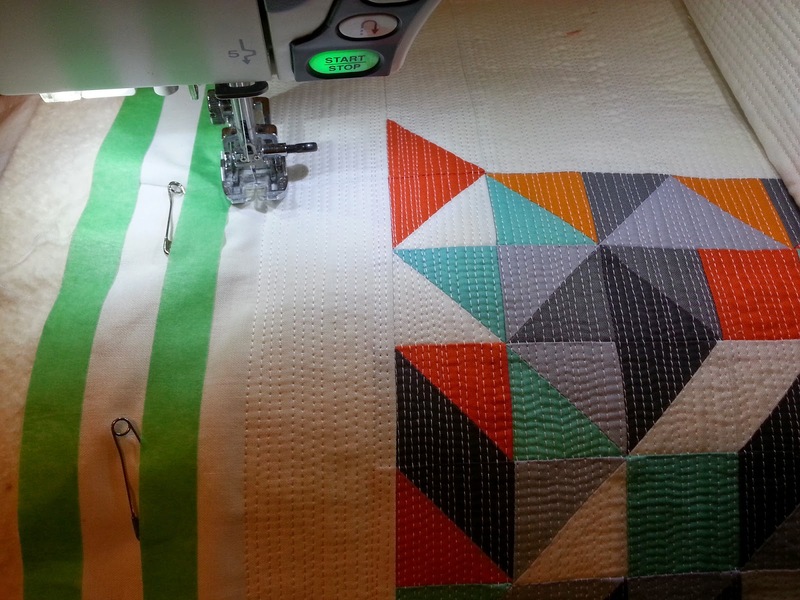 For a double dose of motivation, I signed up all the following projects for the Vancouver Modern Quilt Guild's UFO Challenge that wraps up in October. I'm not kidding myself and saying that all of these projects will be done in time, but I'm hedging my bets and adding them all to the list. 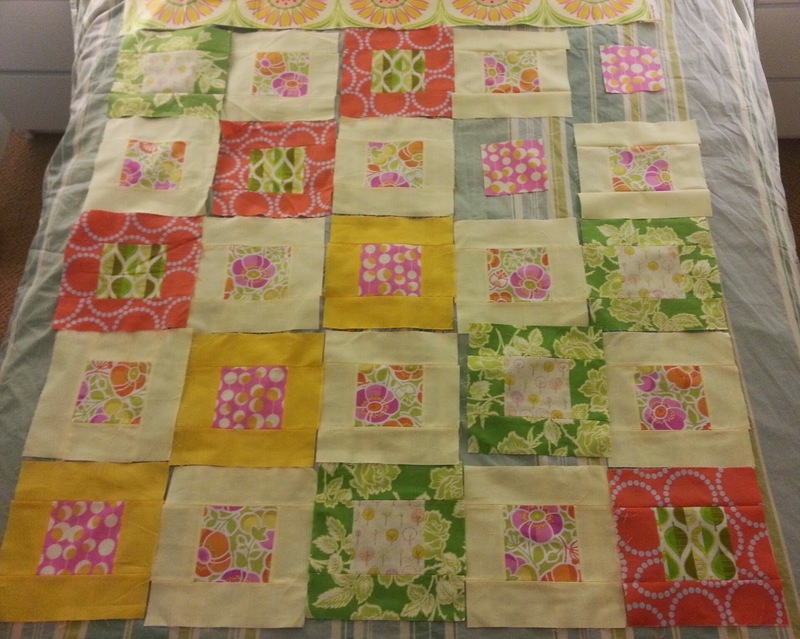 1) Flower Garden baby quilt, started in Fall 2009 (which makes it my oldest UFO!) 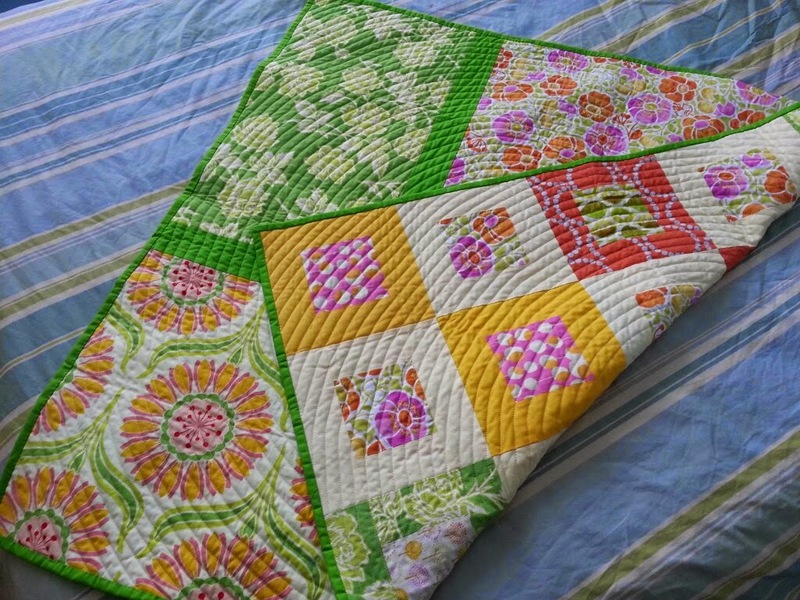 when I bought the "Modern Baby Quilts" pattern from Elizabeth Hartman on Etsy. Lots of HTF prints here, including Erin McMorris's Wildwood, Heather Bailey's Pop Garden, and my first-ever Pearl Bracelets by Lizzy House. 2) Madrona Road LOVE. 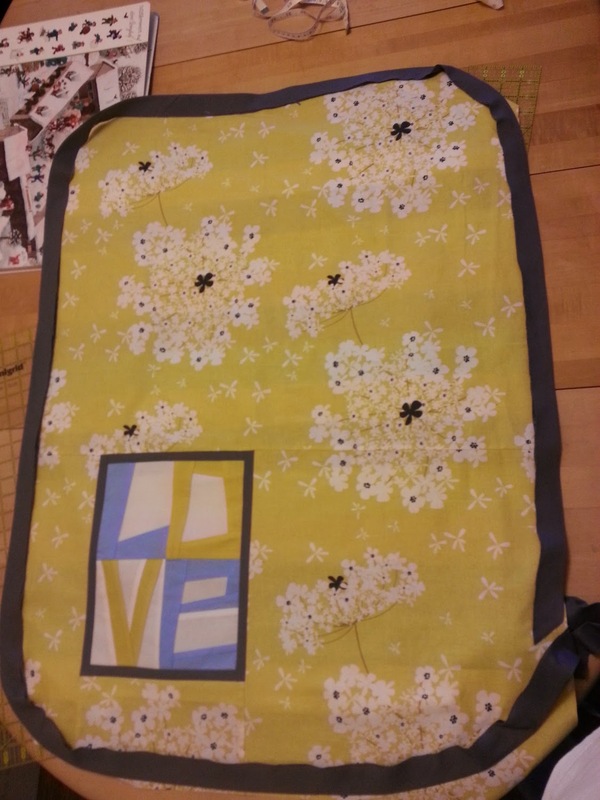 Another baby quilt, made using Kelly of kelbysews' LOVE Mini Quilt tutorial on Sew Mama Sew. I just need to decide what I'm doing for the other side and the quilting. It's small, so once I get going, it shouldn't take long! Started Spring 2013. 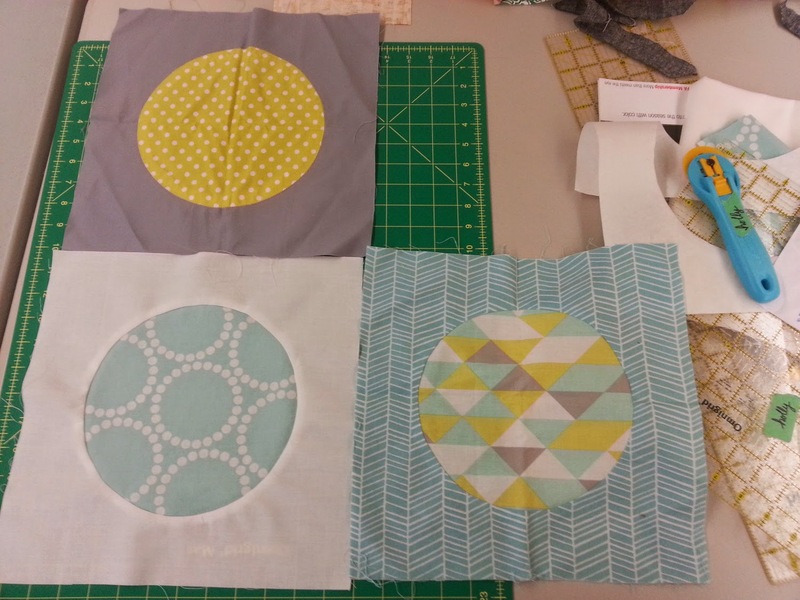 3) Perfect Circles baby quilt. Started in a July 2013 workshop with Cheryl Arkison. I love where this is going, but don't believe anyone who tells you these circles take just six minutes! 4) Neutrals with a pop of colour: My blocks from the Fab Bee members have been supplemented by several blocks from friends. I have 19/20 blocks now and am nearly ready to piece the top. I'm keeping this one for sure! Started May 2013. 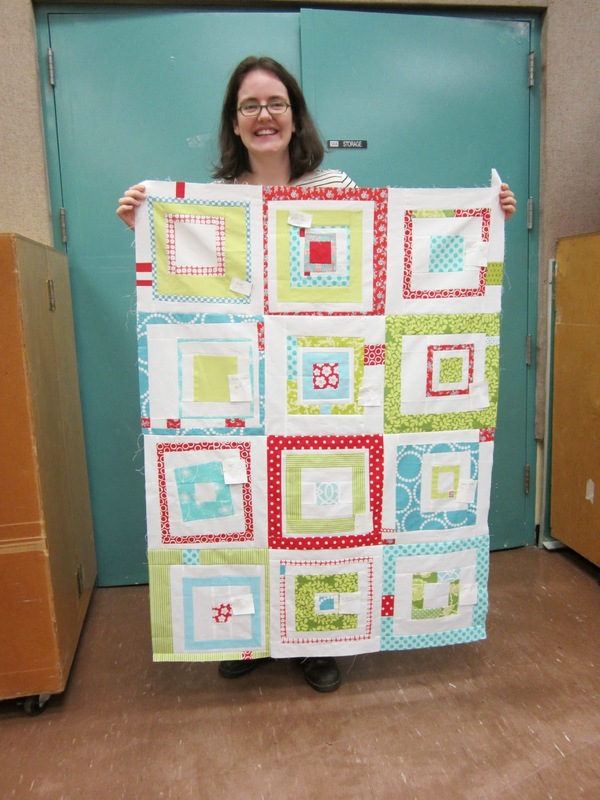 5) Red & Aqua Bee quilt: Started in early 2011, these blocks were made by members of my very first online bee. It was meant as a baby quilt for Ellie, but now that she's three, I think I might need to add to it and make it a big girl bed quilt! 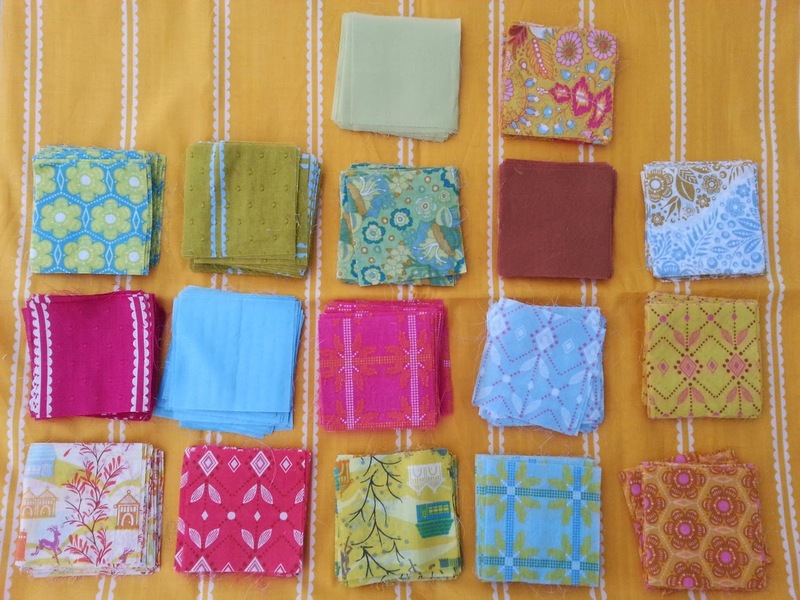 6) Little Folks Patchwork: I won some fabric in early 2010 and decided I'd make a quilt just like Ashley's (Film in the Fridge) beautiful patchwork quilt that I'd fallen in love with. The squares are cut, I just need to assemble them! 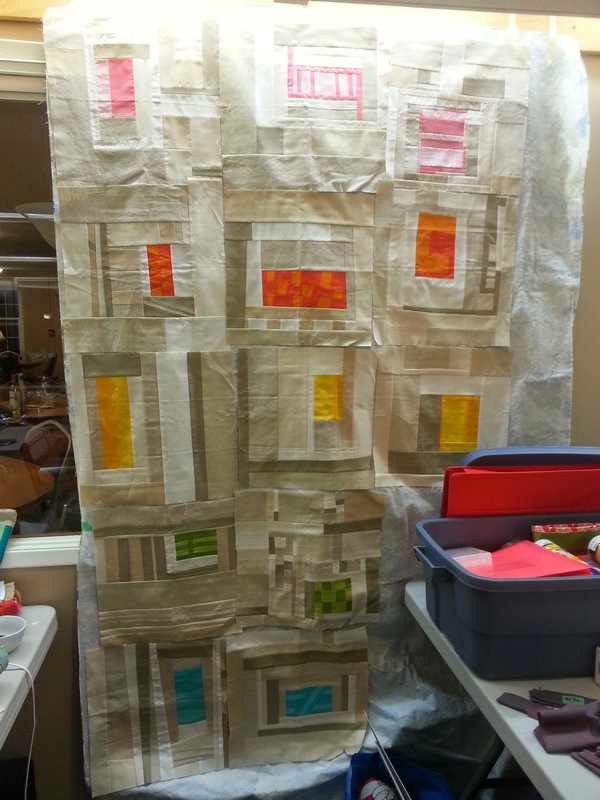 7) Habitat Challenge: I got as far as completing the quilt top in November 2012 and haven't finished it. The top measures 42"x42". 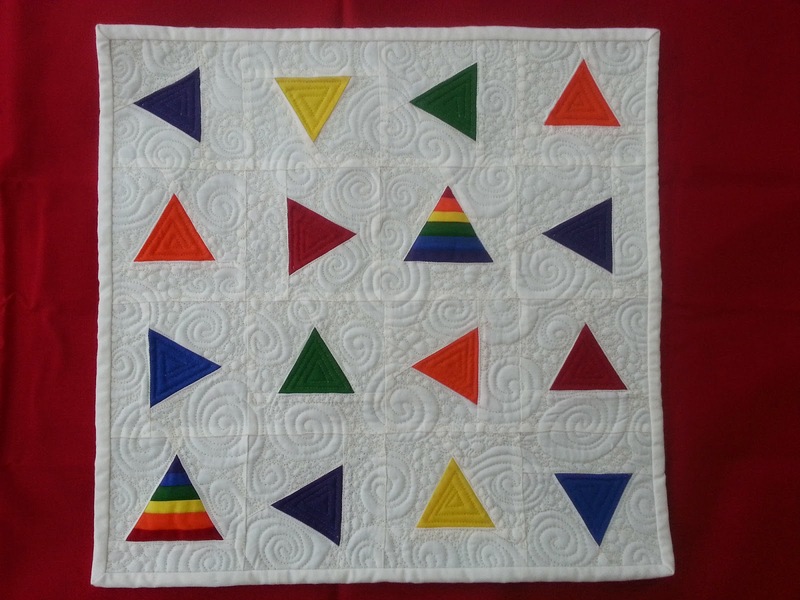 I'm happy to share Cosmic Kites, my latest finish, my project for The Modern Quilt Guild's Michael Miller Petal Pinwheels Challenge, and my first ever half rectangle triangle quilt. 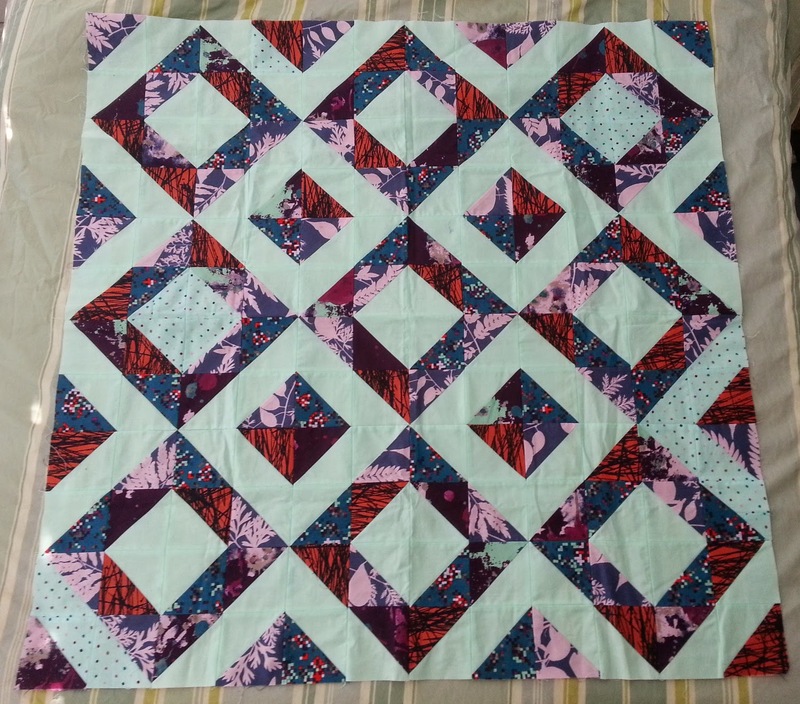 Right off the bat, I want to thank Latifah Saafir and state that I followed her great tutorial on the Modern Quilt Guild's blog all the way from cutting fabric, to assembling my blocks, to the final layout. 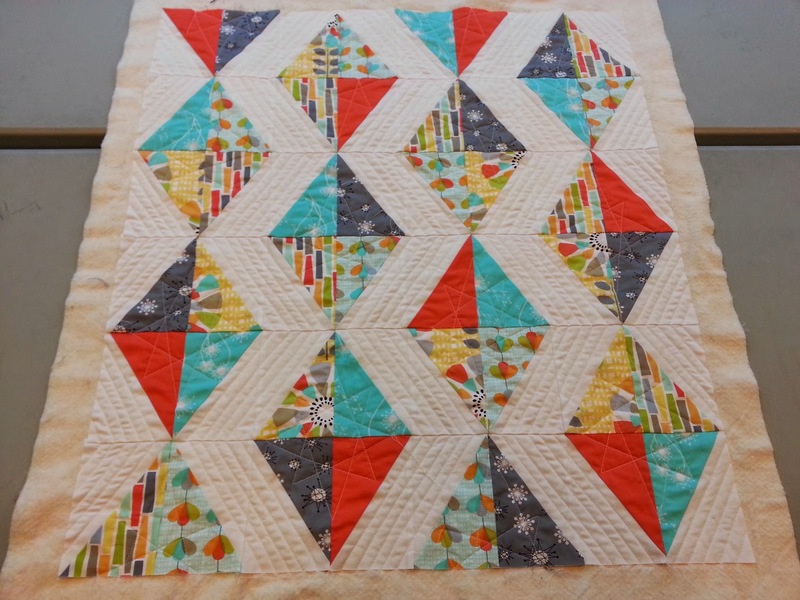 Latifah's quilt is called Kite Tails and I agreed with her that the diamond shapes looked like kites. I quilted stars into the centres of my kites to mimic the shapes in the grey Star Jacks print, hence the name Cosmic Kites. 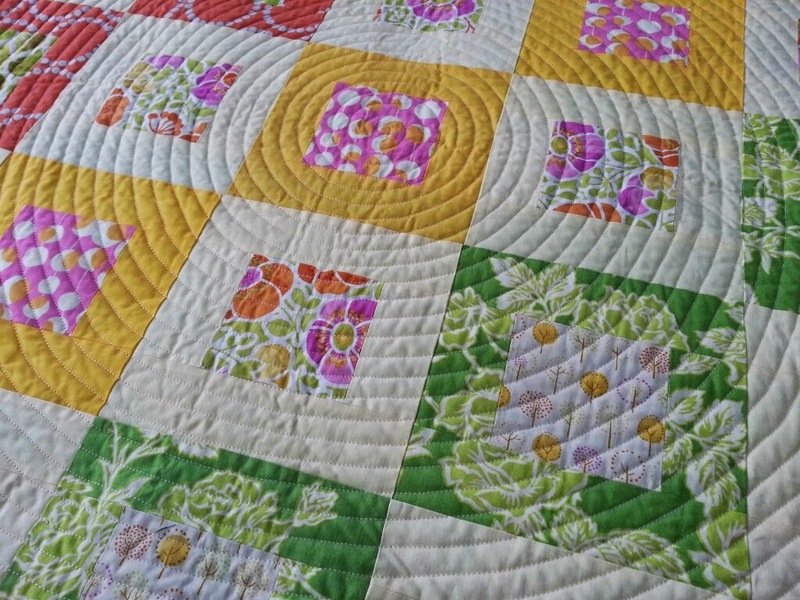 Detail of eight-pointed star quilting. It took me several tries to figure out how to draw an eight-pointed star continuously, but once I figured out the trick of skipping two points and aiming for the third point, it was great! I'd never tried half rectangle triangles (HRTs) and I thought this challenge was a good chance to give them a try! 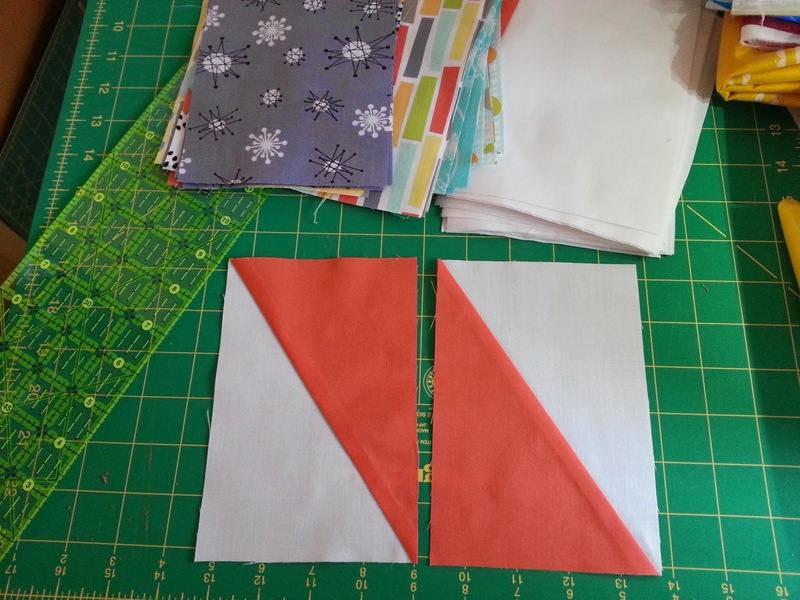 I found them trickier than HSTs and more fussy to trim because you don't just line everything up on a 45 degree angle and cut. There's marking and careful alignment involved. However, they give a great graphic effect, so I may just try them again! 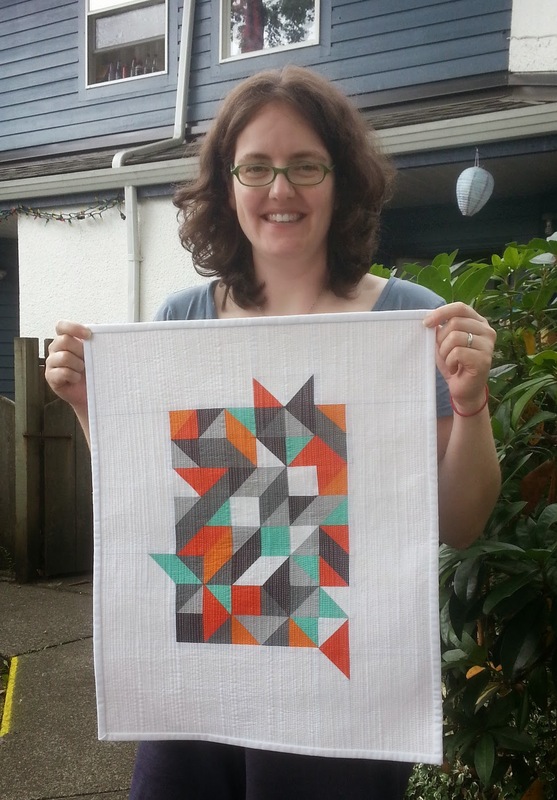 I brought my blocks to a recent Vancouver Modern Quilt Guild all-day sew-in and finished piecing them by lunchtime. I worked surprisingly hard all afternoon and evening and got the quilt basted and quilted by the time I packed up around 8:30pm. I heard plenty of expressions of disbelief in reference to my unexpected productivity that day! (I'm know for chatting and not getting much done at VMQG sew-ins!). I posted the previous picture to Instagram (that's where you can find me all the time these days, my blog isn't nearly as active) and Debbie Jeske (A Quilter's Table) emailed to let me know she'd like to feature this quilt in her July Quilting Trends column on Sew, Mama, Sew! I was thrilled! 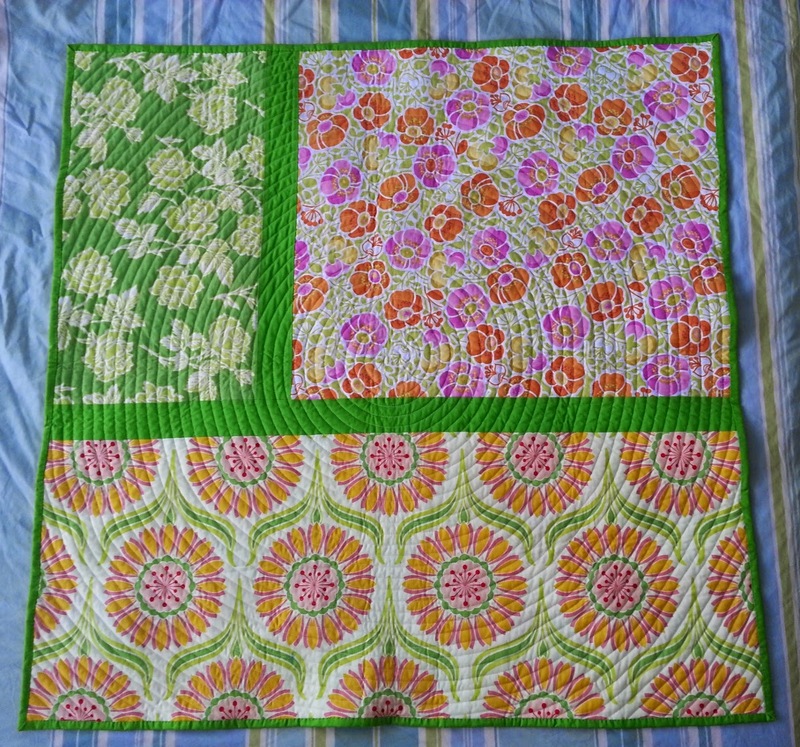 That gave me the incentive to get this quilt bound quickly and I think the Ta Dot print in Apple green brings out the green in the Petal Pinwheels line. Thank you, Debbie! I backed the quilt with an Erin McMorris Leaf Dot print that I'd been saving since I spotted it in a remnants bin at a LQS in Langley that has since closed. 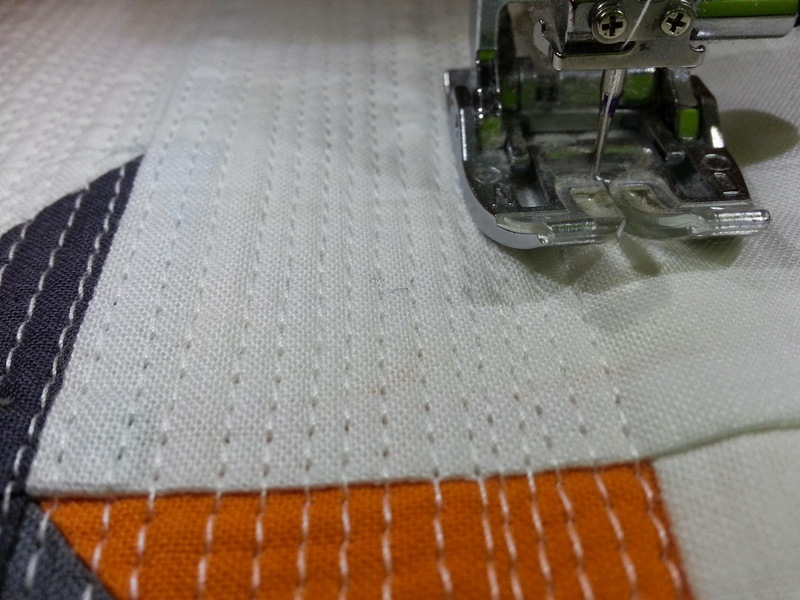 I loved zipping along and sewing up these straight lines (no marking involved) with my Janome 7700. I used Aurifil 2024 in 28wt and the lines have beautiful definition. This quilt will be shared at the upcoming annual VMQG outdoor meeting (don't wanna miss the group photo!) 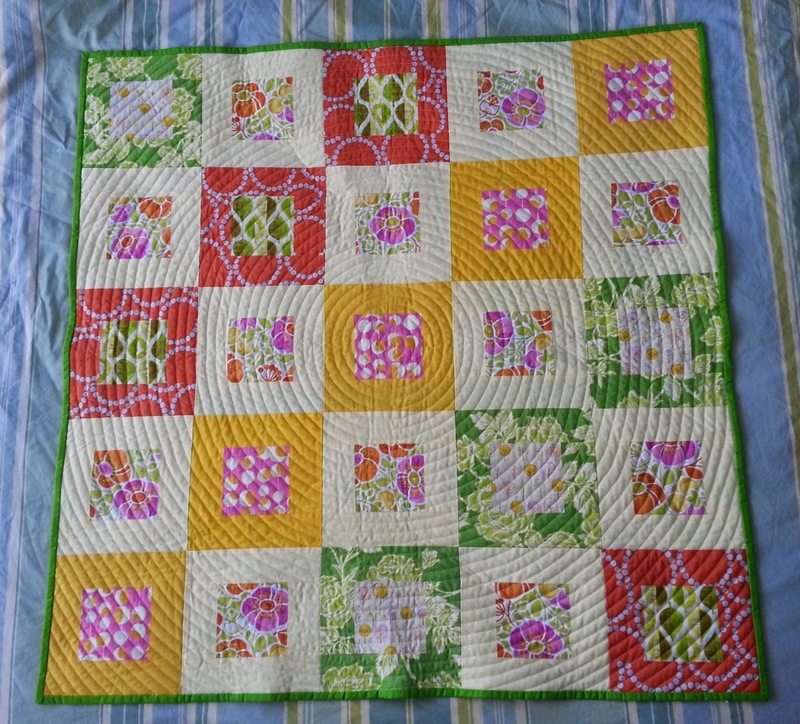 and then gifted to a new little second cousin who was born the day I was quilting it! Have you given HRTs a try? I'm a wife, a mom of two, a quilter (I founded the Vancouver Modern Quilt Guild), a teacher, an aspiring librarian, a bookworm, a good speller, a perfectionist, a lefty, and an environmentalist. I live in Vancouver, BC, Canada.